"I'm in mixed feelings right now," said the mother Zahava Shaul, who accompanied her son for his first day in the army. "I wish him peace and return safely, and I am waiting for him at home, and I hope that they will watch over him in the army," Shaul added, hinting at the fate of her son Oron. n addition, two Israeli civilians who went missing in Gaza - Avera Mengistu and Hisham al-Sayed - are believed to be held by Hamas as well. 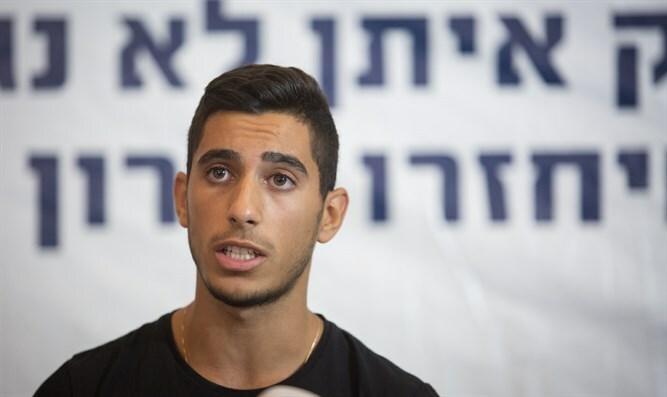 Last month Ofek spoke about his brother for the first time during a rally urging the government to bring Oron's body home. The Shaul's and Goldin's were infuriated after reports suggested that a potential long-term deal with Hamas would not include the return of their loved ones to Israel for burial. "The cabinet members are afraid to make the right decision," Ofek had said. "The government must insist, the cabinet members should demand that my brother, Hadar Goldin and Abra Mengistu and Isham Assad be in agreement and that no agreement be signed between them." "For four years I did not talk to the media, because I could not deal with the pain emotionally, and today I sit here in pain, and worse - angry," added Ofek. "It can not be that an agreement is reached with Hamas on certain issues, and on the other hand, we can not reach an agreement and exert pressure to return the prisoners and missing soldiers."